Forensic techniques have evolved in the last years. There has been a lot of research done and many tools have been developed around forensic in live systems. The analysis approach has changed quite a bit, as previously most of the analysis was done focusing in the filesystem, but now the analysis of the memory is a key step. This is due to the fact that many of the evidence are in memory at some state on account that anything running in a system has to pass through the memory at some point. Additional, there is some malware which runs only in memory and doesn't write to disk, which means evidence can't be gathered through the file system, but only through the memory. Some days ago I wrote about a version of Tinba affecting some Swiss bank which was using Tor, what information can be gathered from the memory of a infected system with such malware? The first thing to do is to obtain a memory dump of the infected system. The are several tools and methods, however I find the tool winpmem from the rekall framework very easy to use. The tool can be used from a external USB to dump the memory in that same USB, which can be later on analysed in the Forensic workstation. 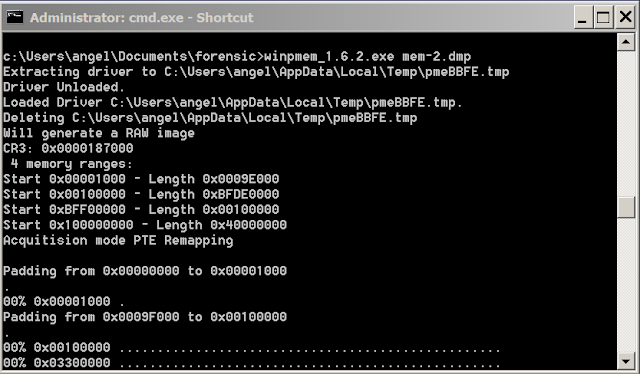 It exists several tools to perform the analysis of memory dumps. Some of them being commercial and some free. From Mandiant, there is Redline, which I wrote about some time ago. Redline permits to gather the data from the system and / or analyse it as well. Also, there is Volatility which is multi-platform and can even be used to perform memory forensic on Android, as I wrote here. In this post I am going to use Volatility, but in future post I will explain how you can do the same with Redline. The first step is to check the process running in memory with 'pslist'. The process highlight in yellow is suspicious as it is not really a known process from the Windows OS. This is worth to investigate. In some cases it might not be so obvious as the malicious process can use a valid process name (like svchost.exe) or might have "infected" a valid process through DLL injection or Process Hollowing techniques. In this case Volatility shows it exist a process with PID 0, which it is also worth to investigate, as this is not something common. In this case I do not see any suspicious DLL. As a note, in the field "Command line", I can see the exactly command which was executed to launch the malicious process. Handles, which basically are any kind of object that the process deals with, like register key, files, Threads, processes, mutant (mutex), directories, etc, can provide very useful information. Running Volatility with 'handles' it is possible to obtain all the kind of handles. However, the output produced by 'handles' can be huge, so to filter out can be done with an additional parameter, like for example '-t mutant', which shows only the mutex (aka mutant). Mutex are programming objects used to synchronised threads in order to guarantee exclusives access to a resource in a specific moment. Malware makes use of such mutant in order to avoid multiple instances of the same malware running in the system. Sometimes the mutex is unique and can be used as fingerprint. Here we see there is several mutants, like "!IECompat!Mutex". Same approach can be used to filter for the register key or any other object. This is done with '-t key'. With 'key' it might be possible to identify malware which creates autorun key to be persistent, or perform any other change in the register. In this case there are not any autorun register involved. volatility --plugins=plugins/ --profile=Win7SP1x64 -f mem-2.dmp svcscan | egrep -e "(ImagePath|Binary Path)" | grep -v "Binary Path: -"
Binary Path: "C:\Program Files (x86)\Common Files\Adobe\ARM\1.0\armsvc.exe"
Binary Path: "C:\Program Files\Windows Media Player\wmpnetwk.exe"
Binary Path: "C:\Program Files\VMware\VMware Tools\vmacthlp.exe"
Binary Path: "C:\Program Files\VMware\VMware Tools\vmtoolsd.exe"
Binary Path: "C:\Program Files\VMware\VMware Tools\VMware VGAuth\VGAuthService.exe"
No suspicious Autorun Service detected, so the malware is not being persistent through a service, neither through a autorun registry key as we saw previously. In this case there is some website visited and some temporal files are stored. In this case, we see that our suspicious process has performed several connections to different IPs: 94.23.50.33 and 103.198.0.2. Malware uses code Injection in order to hide itself in other legitimate process. There are two main techniques for this: DLL injection and Process Hollowing. However, from a memory forensic point of view, both of them looks the same: some memory section/s with executable code is injected to a valid process. Malfind searchs for executables memory section. Malfind has a very high rate of true positives but also false positives happens. Obviously the Verifikation.exe is not worth to investigate as we know this is the suspicious process. For the rest of the process, and after checking, these are false positives. With ldrmodules, same analysis is performed but nothing brings my attention. This piece of malware is not performing any code injection. The main purpose of Rootkits is to hide information from the OS, like network connection, sockets, files, directories, etc. There are several plugins in volatility for this purpose: psxview, modscan, apihooks, ssdt. There is no evidence of rootkit on the system. In this case I am going to dump the suspicious process with PID 3924 and submit to to VT.
Each of this steps give you evidence of malicious behaviour. In this case, it was straight forward to identify the malicious process. There is no evidence that the malware is making itself persistent. Also, there is no evidence of code injection or rootkit code in order to hide itself. The malware perform TCP connection to suspicious IP. Finally, I dumped the malicious process and I submit to VT and 16/54 detected it as malicious.